In the end, we all long for the old times and the people who were there at the beginning. Where am I coming from?Who am I?Where am I going to? In the introduction film called The Highlights of the Permanent exhibition: Where am I coming from? Who am I? Where am I going to? we are exposing some of the most interesting museum artefacts that marked the history of Styria in its unique way. Film portrays the variety of the Regional museum Maribor’s collections. 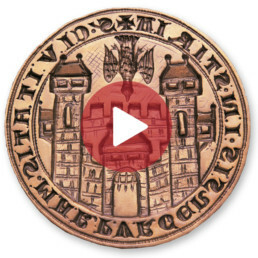 You can stroll among collections of archaeology, ethnology, furniture, art, fashion, craft, arms and armour and among artefacts such as figurine of a boar from the 1st century BC, pharmacy scale from the 2nd half of the 19th century, seal of the city of Maribor from around 1300, sword breaker from the 17th century, sitting furniture from the middle of the 18th century, portrait of Anton Martin Slomšek, officer’s cap of Rudolf Maister, uniform of marshal Josip Broz Tito, a bottle of a popular drink Ora and other interesting artefacts that demonstrate the history of Styria. All of the chosen artefacts can be found at our existing exhibition and at the new permanent exhibition that we are preparing. The exhibition presents individual structures and occurrences from the Middle Ages until the 18th century in Maribor and its surroundings (trading, defence, religion, plague, fires, city government, crafts), which are illustrated by maquettes together with the museum’s artefacts. A reconstruction of a smoke chamber and guesthouse is on display, as well as knights’ armour that visitors can try on. 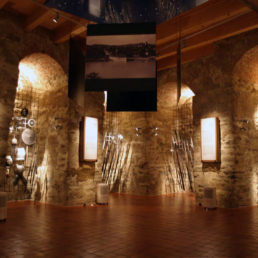 The exhibition is situated on the ground floor of the castle’s Bastille, which was the defensive tower of the city from the mid 16th century and was built under the supervision of the architect Domenico dell’Allio. The exhibition also displays the consolidation of the defensive walls, which was led by dell’Allio, owing to attacks by the Turks, as well as older arms and armour from the museum’s collection. 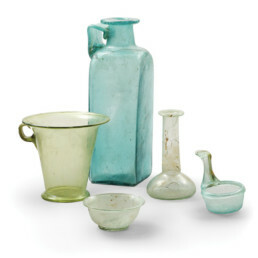 The archaeological exhibition First touch takes us back to a forgotten time. Approximately 1000 chosen artefacts made of different materials are testament to the density of settlement, residence culture and lifestyle as well as burial traditions, material and spiritual culture, social and economic conditions of the Late Stone Age until the early Middle Ages. Models of reconstructed residences provide an insight into residence culture throughout different periods. Developments and discoveries from our region are parallel with findings both in Slovene and worldwide. Discoveries and archaelogical research in the field are presented through projections. The exhibition shows the museum\’s beginnings in Maribor and its development into Maribor Regional Museum from 1896 to 2003 and is set in a location with preserved decorative paintings that were made by Matej Sternen for the purposes of the former Castle cellar restaurant. The first part of the museum\’s exhibition from 1903 is reconstructed, and the collections are presented as a basis for the museum\’s work. The collected heritage defines the museum as a database of the cultural and historical identity of the area and individuals. The integration of Maribor museum into the general development of museums is portrayed on the carpet together with selected events from the history of museums. 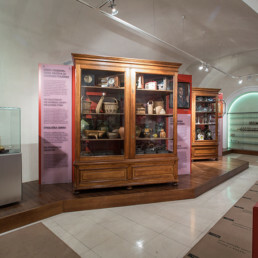 The exhibition displays a reconstruction of a historical pharmacy from the late 19th century. 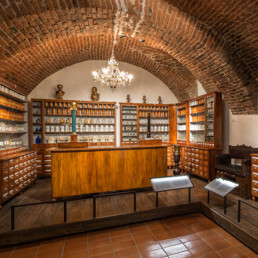 A pharmacy’s saleroom area (oficina) with original pharmacy cupboards, stands, prescription table, pharmacy laboratory with medicine making equipment and materials (storehouse for materials) are on display. Special attention is given to artefacts from former monastic pharmacies in Olimje and Slovenska Bistrica and from the old Styria’s local pharmacies as well as to a pharmacy book from the late 16th century. Visitors can also see, smell and touch herbal drugs and learn about drug abuse.